40 million Americans have student loan debt, and you’re one of them (if you’re reading this). Instead of feeling the camaraderie with other student loan borrowers, you feel lost and alone. While everyone else seems to simply be annoyed by their student loan payments, yours haunt your every breath. You struggle to make the minimum payment, and maybe you’ve missed some payments altogether. You’re teetering on the verge of student loan default. Perhaps part of you has begun to believe defaulting is inevitable. Defaulting on your student loans will leave a major black mark on your credit. Even if you have no intention of using credit cards, having a poor credit score impacts things like your car insurance rates and your ability to rent an apartment. Keep in mind your credit score will also impact your current or future spouse. Defaulting is not an “easy button”. You might face wage garnishment and you will certainly have creditors hounding you. 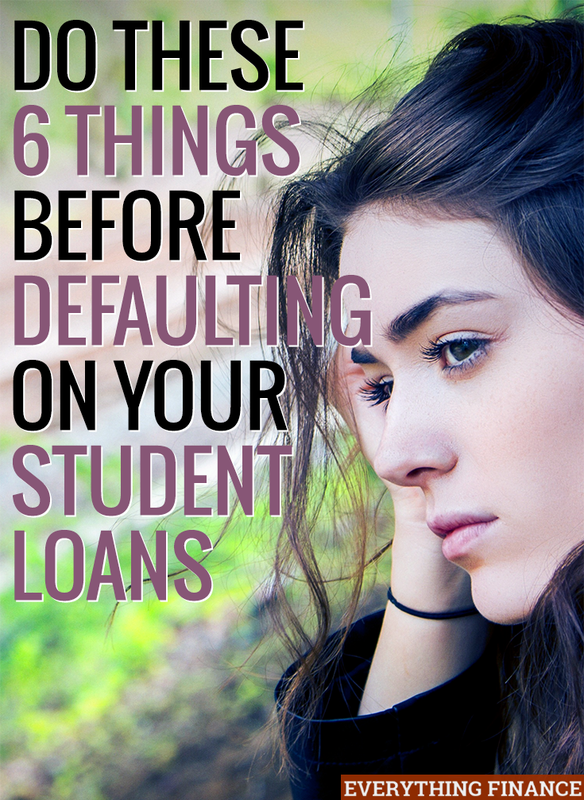 Do these 6 things before defaulting on your student loans. The first step for anyone who is struggling in their finances is to create a budget. Perhaps you already have one, but now is the time to dust it off and give it a good scrub. After creating your budget (including your current student loan minimum payments), look to see which areas you can reduce your spending in. Leave no stone unturned. For each line item in your budget, research how you can reduce or eliminate the item. For example, perhaps you have a cable subscription. This isn’t a necessary expense, so you might decide to cancel it. You might be tempted to say you can’t reduce your car insurance payment, but you could shop around to see if a competitor offers a better rate. While you’re at it, make note of some reductions you might be able to do in the future. For example, you might be able to get a roommate, but that takes a bit of time. You can save an alternate version of your budget that factors in these possible reductions. Use this newly scrubbed version of your budget as a starting point. This budget may still show you don’t have enough money to easily cover all your expenses, but at least you know where you stand. If you’re legitimately having trouble making ends meet, you might qualify for an income-based repayment plan. These plans are for Federal student loan borrowers who don’t make large salaries or whose monthly payment exceeds a significant portion of their take home pay. In order to provide relief, the repayment terms are extended between 20-25 years. The monthly payment amount is calculated using your current location and family size. However, if you are able to make 120 qualifying payments (a minimum of 10 years of payments), the balance of your loans will be forgiven. Note that these payment plans are only offered to federal loan borrowers. If you have private loans, you will be unable to apply for income-based repayment. Also, check out this recent article on student loan forgiveness for public service; basically, if your career qualifies, you’re eligible to have a portion of your student loans forgiven. Additionally, some people qualify for loan cancellation, meaning their entire balance is erased. Whether you have federal or private loans, you can request a deferment or forbearance from your loan servicer. A deferment is a cessation of payments for a specific term. A forbearance might stop required payments or it might reduce the monthly amount. If you have federal loans, a deferment can be granted for up to 3 years if you’re unemployed or unable to find full-time employment. It can also be used for three years of economic hardship. A forbearance can be used for similar reasons, but generally lasts only 12 months. For borrowers with private loans, you will need to contact your loan provider to ask about their options; there are no industry standards. Generally, a private loan company’s deferment and forbearance options are not as generous as the federal options. If you have unsubsidized federal loans, note that your interest will continue to accrue during a deferment or forbearance. That means if you take a 6-month deferment, you might end up with a higher payment when the deferment is over. However, you can choose to make interest-only payments during the deferment in order to prevent that scenario. If you have federal subsidized loans, they will not accrue interest during a forbearance or deferment. Deferment and forbearance options are only available to borrowers in good standing. While you investigate options for relief, make every effort to keep your account current. At a minimum, understand what constitutes “default” for your loan type (270 days past due for federal loans, less for private loans). Make a payment before crossing the threshold. If you have interest rates that are well above the current market rates, look into how loan consolidation or refinancing might help your situation. If you are able to further extend your payment term, plus get a lower interest rate, you might save quite a bit of money. For example, if you borrowed $15,000 at an interest rate of 6.0%, you would have a monthly payment of $166.53 for a 10-year repayment plan. If you’ve paid off $2,000, you can refinance the remaining $13,000 balance for another 10-years, with an interest rate of 5.0%, and get a new payment of $137.89. One caution: if you have federal loans, be careful about consolidating them into a private loan. While you might be able to get a better interest rate and lower payment, federal loans offer the most protections, plus there’s no predicting how future legislation can help you. However, the federal government does offer a Direct Consolidation Loan to borrowers with Direct or FFEL loans. If you have already consolidated once, you cannot consolidate again unless you add in another qualifying loan. You’ve scrubbed your budget. You have checked for relief options. You still have a small gap between your budget and spending. What to do now? The best answer at this point is to find a way to increase your income. There are several ways to do this. First, if you are a superb employee, you can negotiate with your employer for a raise. If that’s not an option, you can look for a new, higher paying position with another employer. Third, you could add on a part-time job, working nights and/or weekends. Finally, you can add on a flexible job (sometimes called a “side hustle”). You can also mix and match these options. For example, get a raise from your employer while taking on a weekend job. Be careful about taking on any extra work – now is no time to lose your primary source of income. First, check your company’s policies to find out if you’re allowed to have a second job. Some employers require their employees to disclose outside income, perhaps even having the venture approved by management. Generally, the employer is checking to make sure the employee isn’t working for a direct competitor on the side and that the second job isn’t a distraction. Don’t work yourself to death, either. You can’t sustain a full-time job, an evening job, and a weekend job for very long. In fact, you’ll be lucky if can perform well at your main job if you’ve stretched yourself so thin. If you have several loans and you have at least one loan with a small balance, look into ways to pay off the smallest balance. The monthly payment for that loan might not be huge, but if you can get rid of it, you’ve created breathing room. The assumption here is that you can come up with cash quickly though a yard sale, selling possessions on Ebay or Craigslist, or even selling a vehicle. Going back to the previous point, you might work a second job (maybe something seasonal) for a short time – just long enough to knock out the smallest debt. If you have a cosigner on any of your student loans, make sure you talk to them about the financial difficulty you’re having. If you can’t pay, that means they will be on the hook for payment. They took a risk cosigning for you and they deserve a heads up. Be sure to be prepared for the discussion. Show them your budget and talk about all the options you have pursued. You might find that your cosigner is willing to be financially supportive, if it prevents them from having creditors on their back. It’s also important to call your loan company and discuss options with them. This is best done before you miss a payment. However, even if you are already behind, call them now. Your loan servicer wants you to be able to make payments so that they can get their money back as quickly as possible. Student loans seem to drag on forever, especially if you are having trouble making your payments. Take a few deep breaths and start working through a plan. You have options! Have you ever considered defaulting on your student loans? What made the difference for you?